The Long Day Closes first came into my life some six years or so ago when my good friend and fellow reviewer Christopher McQuain surreptitiously enquired if I had a region-free DVD player. I responded in the affirmative, and expected some kind of Britpop concert to show up in my Christmas stocking, since the query was fairly obvious and music was how Christopher and I had initially bonded. 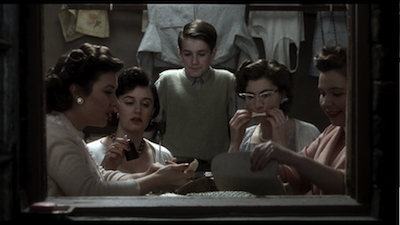 Instead, what arrived was a Region-2 PAL copy of Terence Davies 1992 autobiographical slice of life. 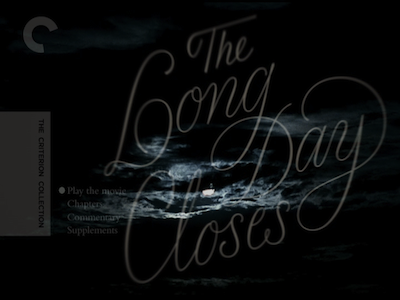 I had no advance knowledge of The Long Day Closes, its release had passed me by in that previous decade. I would have been in college and was drinking in as many films as I could, but there was an isolation to being in school and being just far enough away from a major metropolis that, were a film like The Long Day Closes to come through, it wouldn't have been that hard to miss it. So, when I fired up the gifted disc, it was brand-new territory, entered cold. I was an explorer embarking on an adventure. What I found in this new land was nothing less than astonishing. 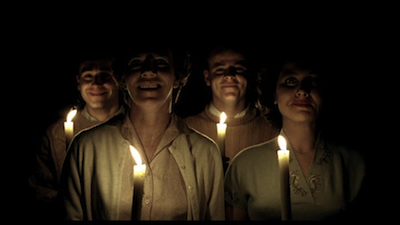 Davies' artful nostalgia moved me in profound ways. His depiction of one life furnished in early beauty touched on so many things that were important to me--the escape of pop culture, abandoning one's mundane existence through cinema and music, and learning from both how to dream, how to use your own imagination with the intention of creating art of your own--this wasn't new territory so much as it was exactly where I lived, and The Long Day Closes dropped like a bomb into my town square. Over the following years, I would often mention this film to others, and was frustrated to find that hardly anyone ever heard of it, much less had seen it. The UK disc was not so easy to loan out. While lots of us nerds rushed out and bought a player that would allow us to get a disc from anywhere in the world for fear of missing out on something, the common populace did not. (In truth, even I have moved on; my decision to not purchase a multi-region Blu-ray player was based on economics and time. I barely have the hours to watch the stuff that is far easier to access than some obscure disc imported from parts unknown.) Unsurprisingly, when Criterion announced they were adding Davies to their collection, I could not have been more pleased. To describe The Long Day Closes is to try to summarize the plotless. 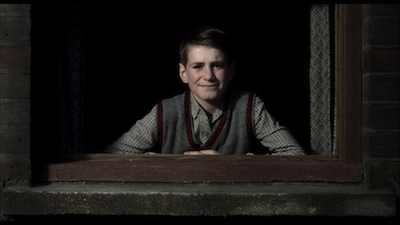 Davies' film recreates his childhood growing up in 1950s Liverpool. It's a string of anecdotes filtered through memory. 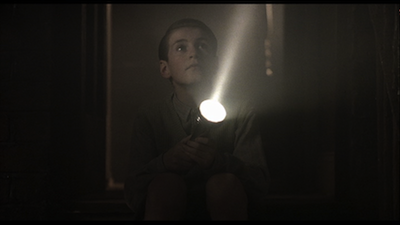 A young boy (Leigh McCormack) lives with his single mother and many sisters and brothers, dividing his time between their home, the movie theatre, school, and church. Davies is not concerned about a specific span of time, but just different impressions of the time, a collection of important moments. Listening to his mother sing songs while doing the laundry, watching his siblings pair off with new lovers, or peering into the adult world by watching older relatives and neighbors get drunk at parties. Some memories are good, some are bad. The boy is bullied at school by kids who rightly assume he is gay, and this contributes to his isolation. He is rarely with others his age, and so movies serve to give him companionship. When going to the cinema is not possible, a window becomes a surrogate screen from which he can watch life in his neighborhood pass by outside or stare at the shirtless construction workers building across the way. (Fittingly, their project is "Smitten's Garage," where crushes are hammered out.) When there is no window, there is his imagination. He can dream about sailing far, far away. Escaping the mundanity of his existence is a running theme of The Long Day Closes. Tracking shots and movement across the frame emphasize that desire. Moments blend into each other, Davies is writing his autobiography as a montage. The reels of our lives are continuous and spin without pause until our individual movie is done. Static shots are for remembering, used when the auteur wants to linger on a feeling, allowing for a brief respite before he has to carry on again. The boy, nicknamed Bud, is at once enjoying and recording a life beloved, living in the midst of it while searching for a an escape into something else. Davies allows all of this to unfold as long, unbroken reveries, soundtracked by classical music, pop standards from the pre-rock era, and snippets of movie dialogue. (Orson Welles narrating The Magnificent Ambersons features prominently.) This aural thread connects all the places Bud must go. 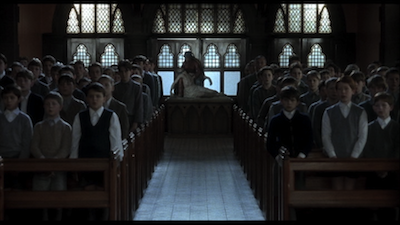 Cinema is church, church is cinema. It is all spectacle and pageantry. 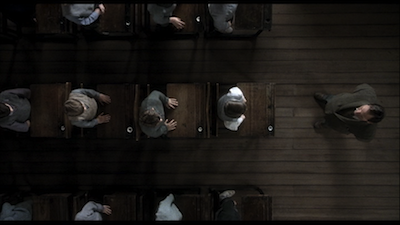 The day-to-day is spent walking the aisles looking for a seat--in school, on the sidewalk, or in the theatre. Our hearts are broken at the movies. 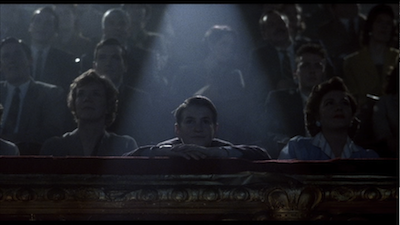 If not by what's on the screen, then by the one we love choosing to catch the matinee with someone else. What makes this artful exercise all the more potent is that, despite being born of nostalgia, what is shown is very much of the moment. Bud is not looking back, he is living the events as they happen. There is no authorial presence imposing a point of view on the tale. Rather, Davies is observing in much the same way as we are, not so much guiding his reverie as he is letting it unfurl from his subconscious at its leisure. This allows each viewer to find themselves within the experience, to let The Long Day Closes move him or her on a purely emotional level, unburdened by intellectualizing or philosophizing. That it concludes in a spiritual place then, should not be surprising, though the true object of worship here is light: the light that gives us life, that illuminates the darkness, and that projects these marvelous images over our heads and onto a movie screen. An Erasure lyric comes to mind. "I guess I'm into feeling higher lately, higher than I've ever been in this thing called love." It's from the opening song off their dreamy Erasure album, and those lines, repeated over and over, are the only lyrics. It's a danceable tune, elegiac in its way, building on this recurring emotion, giving emphasis to the impulse through repetition and celebration. It is, as Orson Welles says in The Long Day Closes, appropriate for Terence Davies' pageant of the tenantry, the last of the great long-remembered dances. Tradition and passion intensify as they head toward their inevitable fade to black.